After attending last year’s South by Southwest, this year the Produce Marketing Association will take the stage as a part of the educational programming. PMA’s chief marketing officer, Lauren M. Scott, will be a panelist in the session titled “Tap Primal Instincts to Fuel Your Food Movement,” alongside Adam Cooper of The Wonderful Company, Lisa Cork of Fresh Produce Marketing, and Stephen X. Springfield of Sentient Decision Science. South by Southwest is an annual event that draws half a million people each year to Austin, TX for festivals and conference programming centered on all things culture, technology, and entertainment. There are 25 conference education tracks and experiential components like PMA’s Global Street Farm. 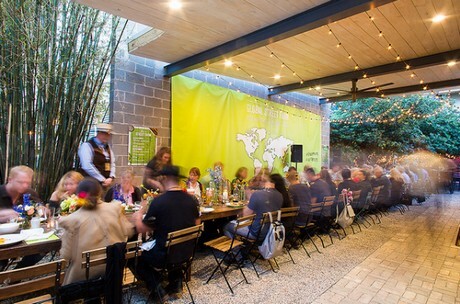 The Global Street Farm invited SXSW attendees to sample fresh produce and be styled with floral crowns and flower braids. It will be back this year and will serve as a home-base for the produce and floral industry members in attendance at SXSW. Center for Growing Talent will also be on the ground at SXSW, bringing their yearly Executive Leadership Exchange (ELE) to Austin. ELE attendees will participate in two days of curated sessions with the final day spent as an immersion day at retailer H-E-B with structured activities and discussion.